This popular style of bollard is made with stainless steel to provide a sleek and strong security & pedestrian control product. 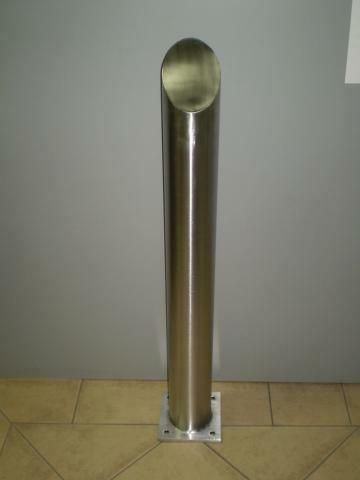 This popular style of bollard is made with stainless steel to provide a sleek and strong security control product to suit general security and pedestrian control requirements. This product has been widely used in shopping centres, hospitals, banks, places of business and other public areas. With an easy to install base plated fixture, these heavy duty bollards are available in stainless steel, galvanised or powder coated finishes. They are also available in a variety of sizes to suit your specific needs. Pricing for this product is for the dimensions specified above. Available in flat or angled top design. Angled design is an additional $20. The cost of the plate is included in the listed price. Our base plated bollards are made in here in Australia. Discounts are available for bulk purchases. Any questions prior to purchase can be sent directly to our sales team at sales@stainform.com.au or call (02) 4677 0470 for more information. Items are available for pick-up in Picton NSW or delivery to be calculated upon purchase. Contact our team for a shipping estimate.